The 94th AMS Annual Meeting will be held 2–6 February 2014 at the Georgia World Congress Center in Atlanta, Georgia. As in previous years, the Society will sponsor a Career Fair at the beginning of the meeting. Spring is in the air in Boulder, Colorado, and hearts and minds are changing as quickly as the trees are blooming! One unnamed developer within Unidata has had his heart enlarge so much that it would make the Grinch blush. The European Geosciences Union (EGU) General Assembly will take place in Vienna, 22-27 April 2012. Authors are invited to submit abstracts by Tuesday 17 January 2012. The National Science Foundation is seeking to facilitate the conduct of geosciences research by supporting community-based cyberinfrastructure in an effort called EarthCube. The project is a joint effort between the NSF Geosciences Directorate and Office of Cyberinfrastructure, and seeks to greatly increase the productivity and capability of researchers and educators working at the frontiers of Earth system science. The project team has set up an EarthCube community web site at http://earthcube.ning.com/. The goal is to create a forum that enables broad participation from the geosciences community and to solicit comments and white paper submissions to the EarthCube project. 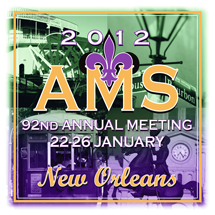 The 92 Annual Meeting of the American Meteorological Society will take place 22-26 January 2012 in New Orleans, Louisiana. The submission deadline for many abstracts is 8 August, 2011. See the Call for Papers for details. The theme of the 2012 AMS Annual Meeting is "Technology in Research and Operations." This theme will address the profound impact technology has had and will have on research, operations, the business of our environmental sciences, and the public. Technology advancements have greatly lowered the human suffering and loss of life in the United States and around the world from the deadly and costly effects of extreme weather and ecological disasters. Unidata community members may be especially interested in participating in the 28th Conference on Interactive Information Processing Systems (IIPS), held during the annual meeting. See the IIPS conference page for details.